All pricing is subject to change. For all prices, products and offers, Wee Hoose of Supplies, reserves the right to make adjustments due to changing market conditions, currency exchange rates, product discontinuation, manufacturer price changes, errors in advertisements and other extenuating circumstances. Every effort will be make to provide original publications however all books are subject to reproduction. Although Wee Hoose of Supplies uses every effort possible to include accurate and up-to-date information on the Site, Wee Hoose of Supplies, makes no warranties or representations as to the Site's accuracy. Wee Hoose of Supplies, assumes no liability or responsibility for any errors or omissions in the content on the Site. Orders are not binding on Wee Hoose of Supplies until payment has been received. Wee Hoose of Supplies reserves the right to cancel any order at any time and refund any monies paid by the customer. Wee Hoose of Supplies charges $25 to put items online for sale. This fee is payable even if your item does not sell. Additionally Wee Hoose charges a flat 10% of the total selling price excluding tax for all items put on consignment. If Seller does not provide pictures of item(s), then there will be a $5.00 charge per item for Wee Hoose to take pictures. All shipping fees are the responsibility of the Seller. All items put on consignment will be posted online for 45 days. After that, the Seller will be charged another $25 to put it online for an additional 45 days. For more information, please contact us by phone at 860-526-9328 or email. Shipping charges on all orders vary. Contact Wee Hoose of Supplies, LLC for other shipping options. All returns must be made within seven (7) days with receipt, less 15% for restocking. All sales are final after seven days. Bagpipes, sporrans, kilts, hand knit products and jackets are considered made-to-order items and are non-returnable except for manufacturer's defect. For further information not listed, please contact Wee Hoose of Supplies. Please call 860-526-9328 or email us to obtain a Return Merchandise Authorization (RMA) number before returning your purchase. No returns of any type will be accepted without a RMA number. All returned products MUST be 100% complete in new, resaleable condition. All returns must contain ALL original boxes and packing materials, contain all manuals, blank warranty cards and other accessories and documentation provided by the manufacturer. You are responsible for shipping charges on returned items. Wee Hoose of Supplies strongly recommends you fully insure your return shipment in case of loss or damage. IN THE CASE OF YOUR PURCHASE IS RECEIVED DAMAGED FROM TRANSIT, REFUSE THE DELIVERY SO THAT IT COMES BACK TO WEE HOOSE. If you accept the package, make sure it is noted on the carrier's delivery record so that Wee Hoose of Supplies can file a damage claim. **** PLEASE NOTE **** We cannot accept returns of reeds due to health reasons. 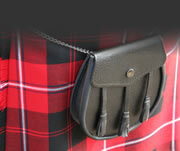 Only defective bagpipes, kilts, jackets, hand knit items, and sporrans can be returned to Wee Hoose of Supplies,. Non-defective returns on these items are not accepted. The return must take place within seven (7) days of invoice date. Wee Hoose of Supplies will accept certified bank checks. Wee Hoose of Supplies will accept personal and business checks for prepay orders, but please allow an additional 10 business days for clearing. Wee Hoose of Supplies attempts to ship all items within 48 hours from stock. In the event that we are out of stock, you will be notified of the delay. For orders that are placed on either Saturday or Sunday or after business hours, we will count the next business day as the ordering day for this purpose.